Because my job requires me to work weekends, monday is to me what sunday is to most. Which means today, I spent the entire day relaxing & unwinding, and for that, I needed a proper playlist. 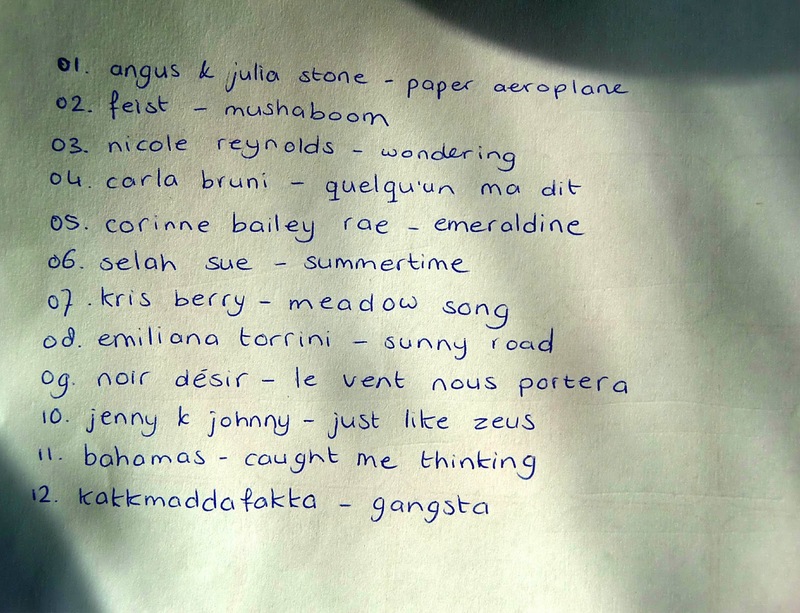 About 90% of the artists I listen to are male, but today, with the sun shining and the birds singing and me being in desperate need to de-stress, I felt like listening to some soft, gentle female voices. So in a way, this is a tribute to some of the ladies in my music collection. The list also includes the song that inspired the title of this blog, my alarmsound and some french songs to remind myself that I was going to learn french. And because youtube-ing them one by one would make it all a lot less relaxing, I gathered the links for you. It starts out slow, and ends with one of my favorite silly happy songs, bringing back memories of a very awesome concert I was once lucky enough to enjoy.